BASEBALL (caps), HOT DOG, APPLE PIE AND A CABERNET: what's more American than putting (or saying) something on (or off) the top of your head? And what's more gloriously patriotic, than to coordinate your 4th of July outfit with the colors of ol' Glory? 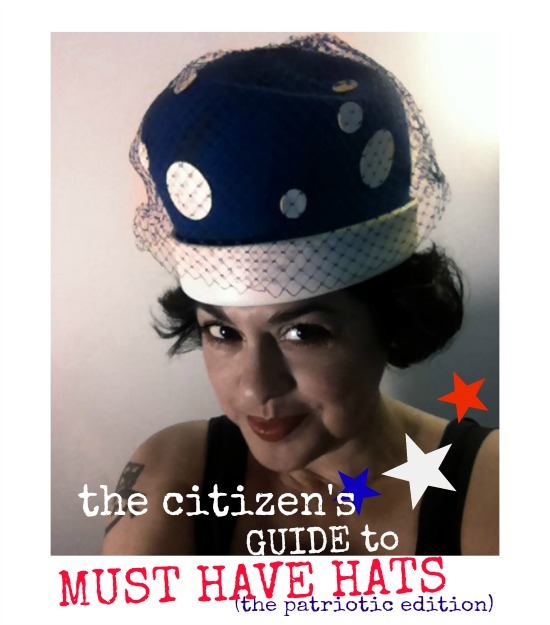 STARS + SPANGLES: in honor of the Style Crone's one year anniversary of HAT ATTACK and in celebration of our nation's birthday, may I present you with THE CITIZEN'S GUIDE TO MUST-HAVE HATS, the patriot edition. 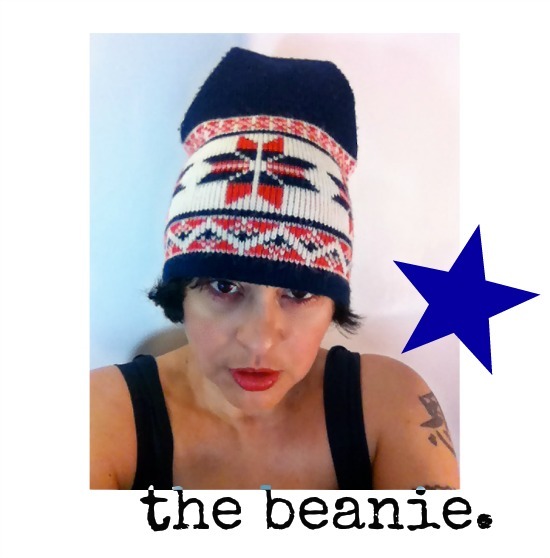 THE BEANIE: every girl worth her beans needs a go-to close fitting knit cap to wear, whenever, and for whatever. 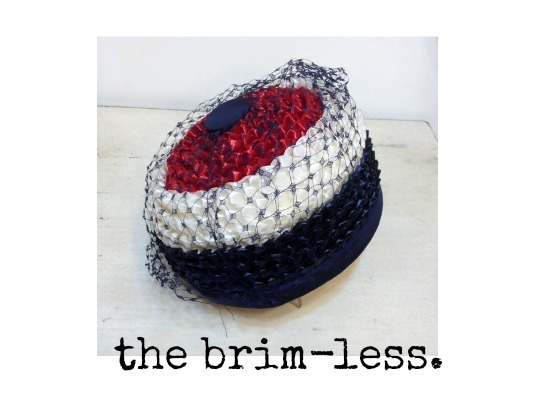 THE BRIM-LESS: be a pillbox, beret or skull cap, a brim-less hat is all about YOU. Not for the faint of heart, your brim-less hat choice will draw attention to your gorgeous mug- which I presume is heavy on delicious. THE BUCKET: while technically a "bucket hat" is a crushable, usually cotton hat often seen on gents and ladies by the sea, the shape has crawled up from its sea-side origins and evolved into stylish short brim hats affecting a jaunty and nautical feel. Case in point, this vintage 1960s number, done up in woven straw, netting and a sassy white brim with buckle. The example shown, while not something likely to actually dip her toes in the pool, IS something to wear with one wants to look nautical by nature. 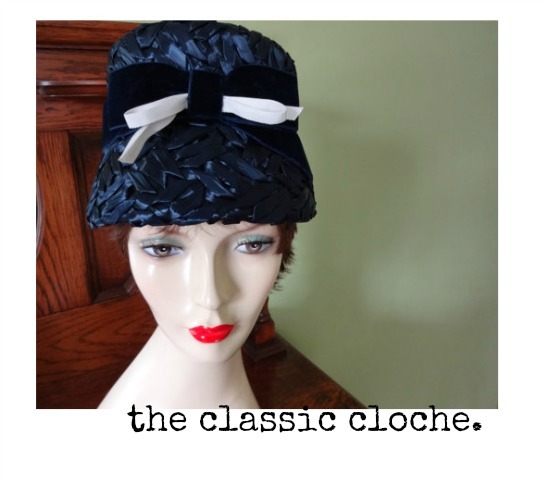 THE CLASSIC CLOCHE: while the cloche moniker gets sprinkled willy-nilly over nearly any old hat these days, a true cloche is a close fitting, bell-like shaped hat, as invented by milliner Caroline Reboux, and was most popularly worn in through out the Roaring 20's. WHAT TIME IS IT? Well, in the case of a MUST HAVE HAT to own, we assure you, it is always (own) ONE O' CLOCHE. THE (CRUSHABLE) WIDE BRIM: it can go either way- you've got a crush on this super versatile, practical and stylish hat, and it crushes- as in folds up and gets stuffed into your summer satchel when you're not sunning (or looking stunning) in it. THE FASCINATOR: formerly formal, the fascinator has evolved well beyond the merely fussy + fancy occasions like a wedding, and into the heady world of evening mixers and cocktails. 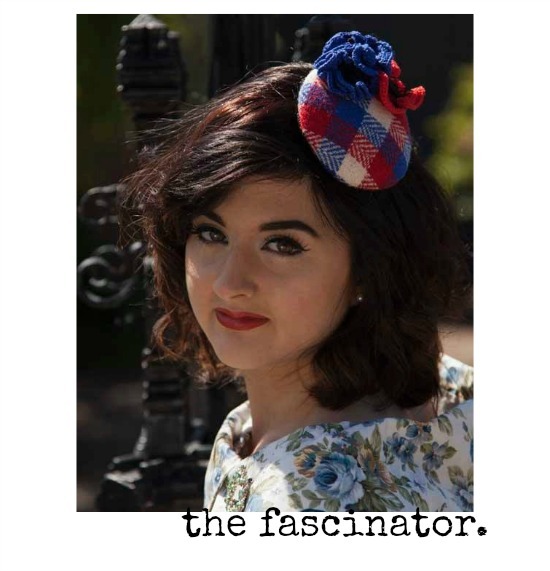 Traditionally made from wool or lace, feathers or flowers, your de rigueur fascinator declares you fascinating and makes for fodder for an invigorating conversation starter. 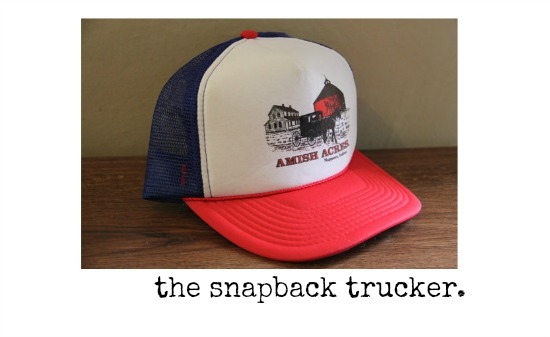 THE SNAPBACK TRUCKER: this unisex Americana essential is most always best worn with sense of post-modern irony; a novelty snapback trucker is a fun way to wear some silliness in earnest. 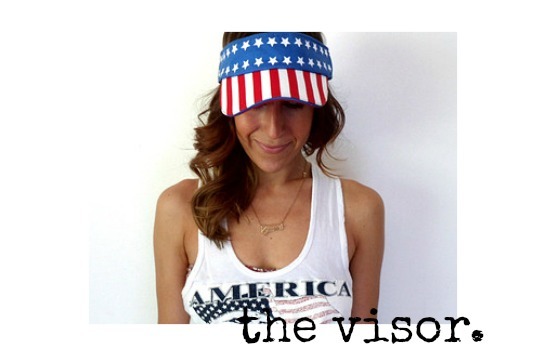 THE VISOR: born from need to protect those beautiful peepers from the sun, the visor is, in our humble American opinion, an unsung style hero- donned best with a healthy dose of outdoorsy, with just a whiff of patriotic camp. 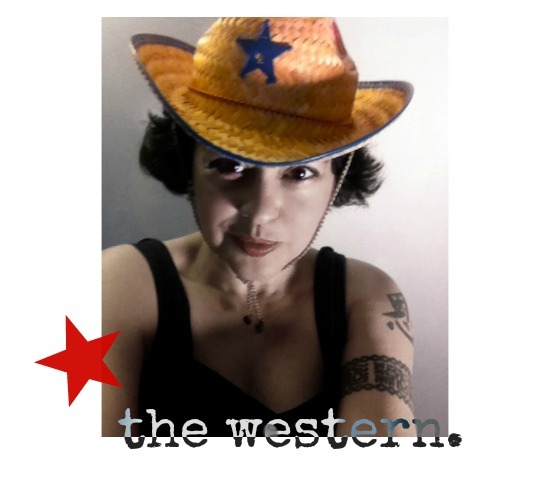 THE WESTERN: no self respecting filly can go without at least one killer cowboy hat in her arsenal of awesome. 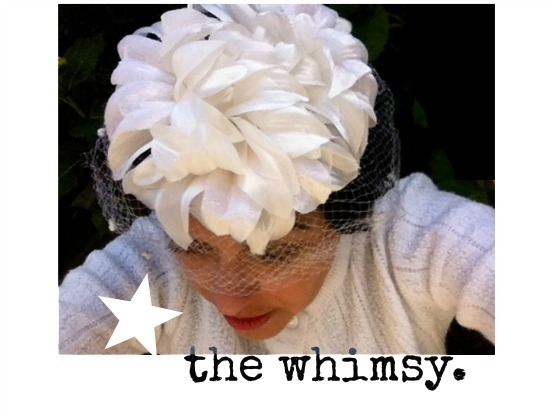 THE WHIMSY: made popular in the 1960s. a spin-off from the fascinating fascinator, a ‘whimsy’ is a draped veiling over the face, gathered together on top of the head and finished with a flower or decorative feature. Not quite a hat-HAT, more of an hat innuendo, a hint, a whisper, a whimsy. In short, a frenzied flocked and floral headpiece sprouting a froth of netting that one would pin atop the 'do. So tell me, did I miss an essential hat to own? Which hats are your MUST HAVES? 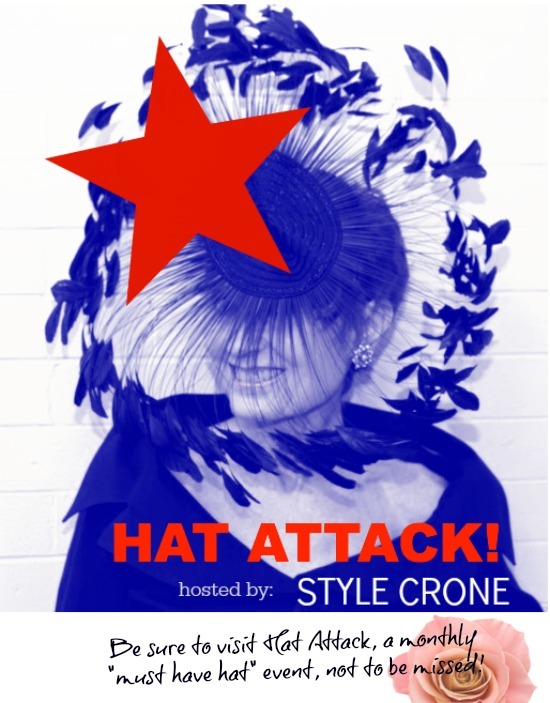 Linking up to the Style Crone for her monthly HAT ATTACK. In honor of this monthly MUST HAVE HAT event, we're offering up a special discount just for Judith and her Style Cronies. 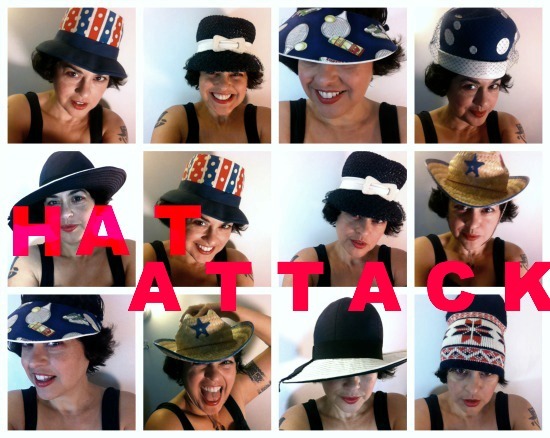 For the duration of HAT ATTACK (from July 1-7th) you can get 15% off your order in our Etsy shop (minimum purchase $10). Just enter promo code HATATTACK to "top" off your savings! I love this post. So much fun! Your writing is as fascinating as you are! Thank you so much for celebrating and supporting Hat Attack's first anniversary. You are a jewel in blogland! Your style guide for patriotic hats is a must read for hat lovers! 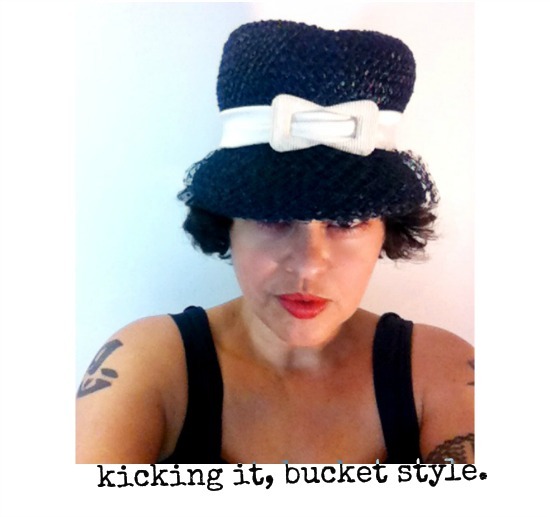 Thank you Bella, for sharing your chapeau and you beauty with Hat Attack! You are just too dang cute! Seriously? No one could put together an array of hats like you just did and look fantastic in all of them. I could buy everyone of those hats if I could pull them off like you just did. I do want you to know, I'm wearing my Bella straw hat as I'm typing this. By the way, I did go through the 'trucker' hat phase and quite enjoyed it. Bella, it's good to see you are back in rare form again! As the others have said, you look great in them all! I'm inspired to bring my wide brim crushable back from its exile at our holiday property and wear it in town. 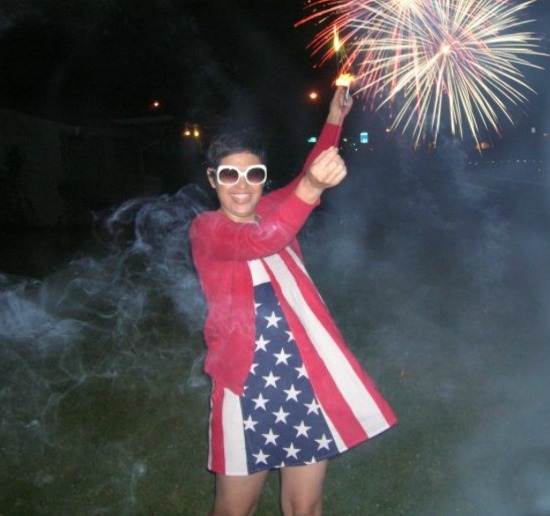 I love your Stars and Stripes dress, and how fitting to share it with sparklers! Bella, you're the best. Your energy is an IV for the weary. :-) Love you!!!! I love hats and the picture of you in that Western number is happiness! I hope you have a killer 4th Bella! What a fantastic selection of hats, and a great post too! What a fun collection! 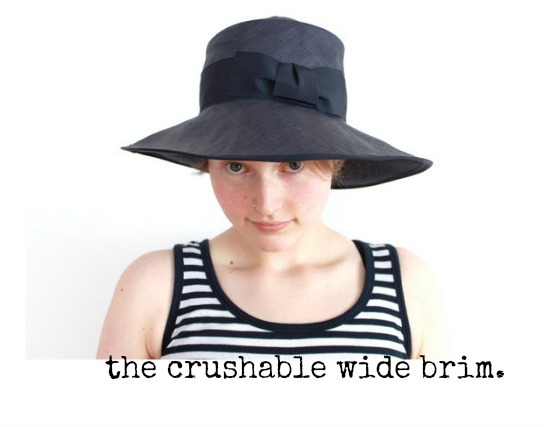 I especially love the crushable wide-brim. They're all adorable!! Love the pic with you and the firecracker! Great guide, and I think I want like half of these! You look so good in hats dear Bella, just like Judith. I love all of them on you, but especially the Western one and the elegant one in the collage: bottom row, second from right (probably the same middle row on the left). My problem with hats is: they ruin my hair and they get blown off. But I do like them.